THE TRIP IS SOLD OUT! Our MMM and Mothers will join Fr. Woodrow for a special trip to visit “Our Sisters” who have not only crafted our beautiful vestments, but have also released sacred music CDs! The MMM will spend an entire day with the Sisters, and will attend a Solemn High Mass offered on July 26 for the Feast of Saint Ann. We will meet the Kansas City MMM as well! Please see the reservation form and the flyer for further information. We have recently completed a new brochure about the Maidens of the Miraculous Medal! Please click on the link on the left column of this page to view and download the file. A SPECIAL INVITATION TO ALL MMM AND THEIR FAMILIES! PHOTOS FROM SOME OF OUR RECENT EVENTS! Girls and young ladies are invited to join a very special group dedicated under the patronage of Our Lady of the Miraculous Medal. This group joyfully offers prayer support for our priests offering the Traditional Latin Mass here at the Church of St. Anthony, as well as service to our growing Community. 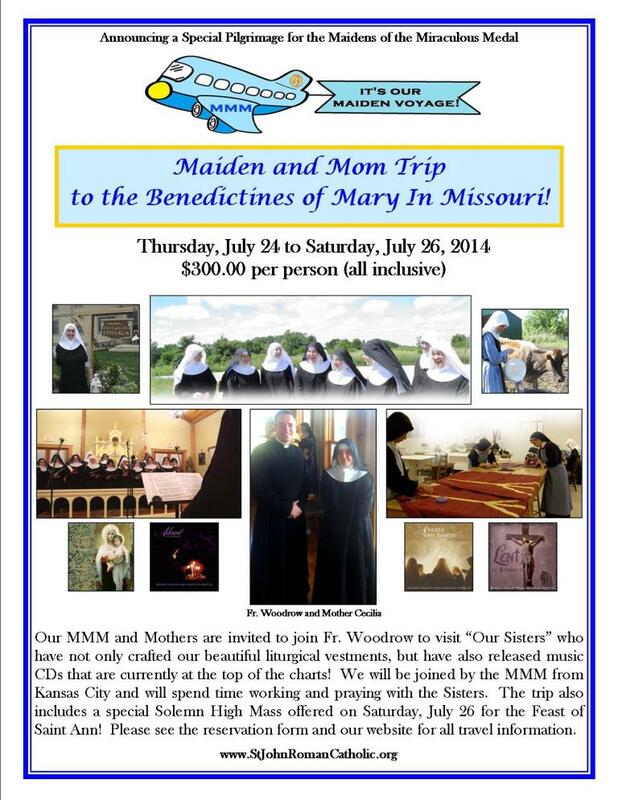 The MMM assist with offering our educational and devotional items and with all of our pilgrimages and community events. 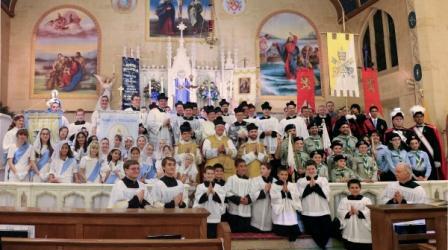 The MMM process at all special Masses (Solemn High and Pontifical) and coordinate the May Crowning. If you are interested in joining this special group of young ladies, please send an email to: UsusAntiquior070707@gmail.com . Mothers are welcome and encouraged to attend the meetings with their daughters, if possible. Please check your email for additional information on this important practice, as we prepare for the May 30 Corpus Christi Procession and High Mass at St. Vincent DePaul. As always, this meeting will coincide with the Altar Server Practice and the Schola Practice. We will begin and end together with prayer and/or Benediction in the Church with the boys and the choir before a big group dinner in the Church Hall. Families are invited. Be sure to visit the NEWS Tab for the latest pictures and information from all recent events for our Maidens of the Miraculous Medal. 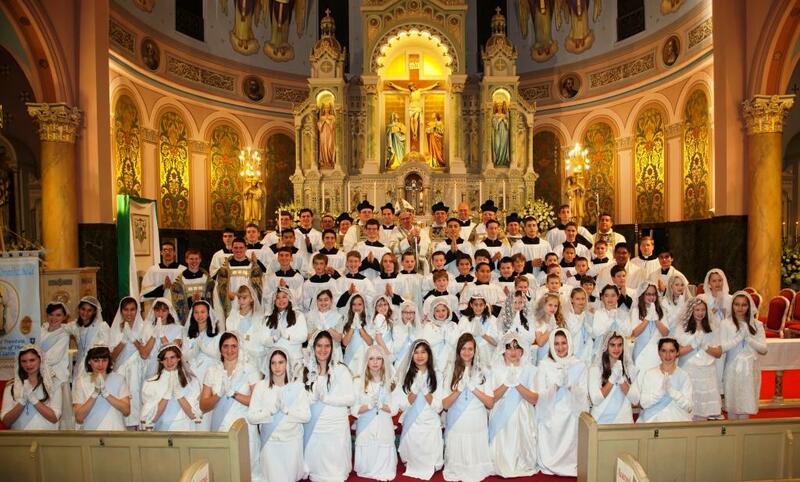 They have recently participated in the May Crowning at the Cathedral of St. Mary in Trenton (May 12, 2013), and were formally inducted as MMM before our own May Crowning at the Church of St. Anthony on May 5, 2013. The MMM were also instrumental in assisting with the 1st Annual Traditional Latin Mass Family Picni c on April 21, at which our Bishop David M. O'Connell, C.M. was honored with a surprise birthday party. 2. 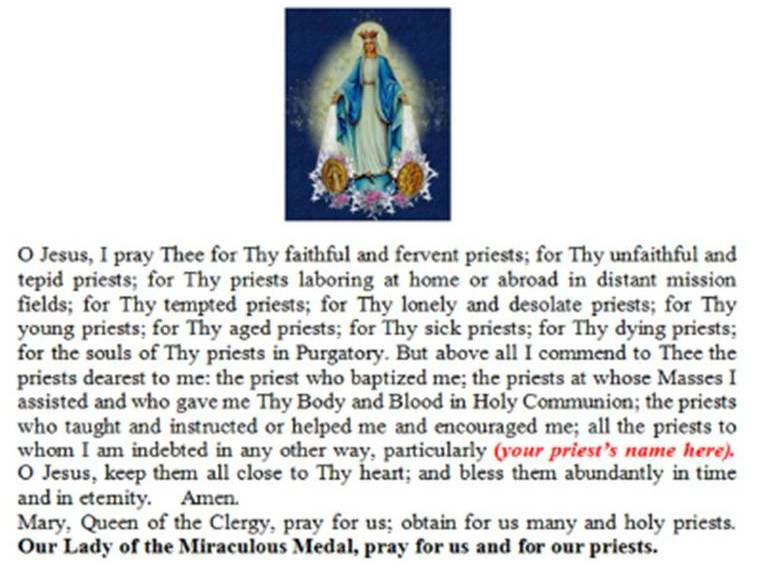 The Maidens of the Miraculous Medal have a threefold purpose: to worship Almighty God, to pray for priests, our Bishop and the Pope, and to serve the Church . From these three aspects, five main teams have been created. Each MMM will choose a team to work with for one year. 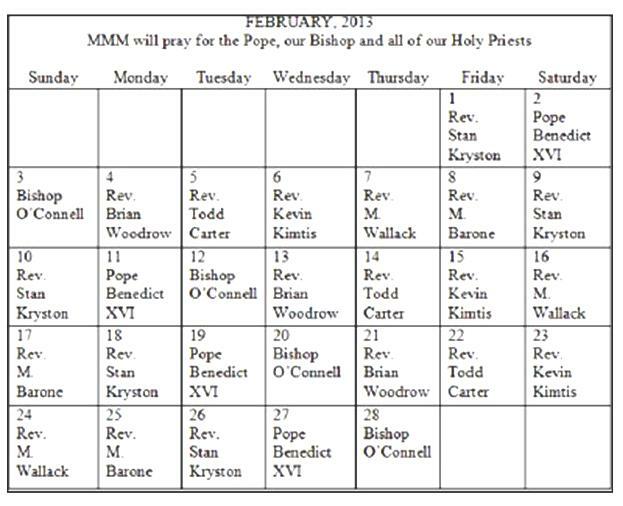 * The MMM pray each day for the Holy Father, Bishop David M. O'Connell, C.M. This is an important meeting and practice for all of our MMM, Altar Servers, and our new Traditional Latin Mass Schola. * Please meet in the Church at 10:00am for a group prayer with the Altar Servers and schola. We will go downstairs for the MMM meeting. Everyone will return to the Church where Fr. Woodrow will lead Adoration followed by Benediction of the Most Blessed Sacrament. Lunch for all will follow in the Church Hall. On Saturday, January 11, a charter bus filled with our MMM, their Mothers, and several of our Altar Servers traveled out to Elysburg, PA to visit the Carmelite Sisters at the Monastery of Jesus, Mary and Joseph. A beautiful Solemn High Mass was celebrated in the Monastery Chapel by Fr. Woodrow (Celebrant), Fr. Barone (Deacon) and FSSP Seminarian Mr. Charles Vreeland (Sub-Deacon, who will be ordained in June). Everyone had an opportunity to meet with these joyful Sisters after lunch. 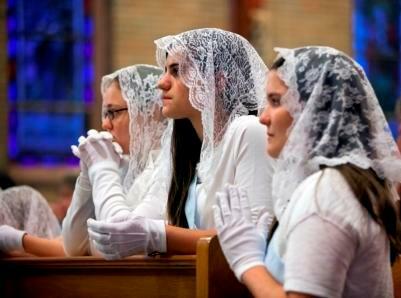 May God continue to bless these wonderful Sisters and their young and very rapidly growing Community! 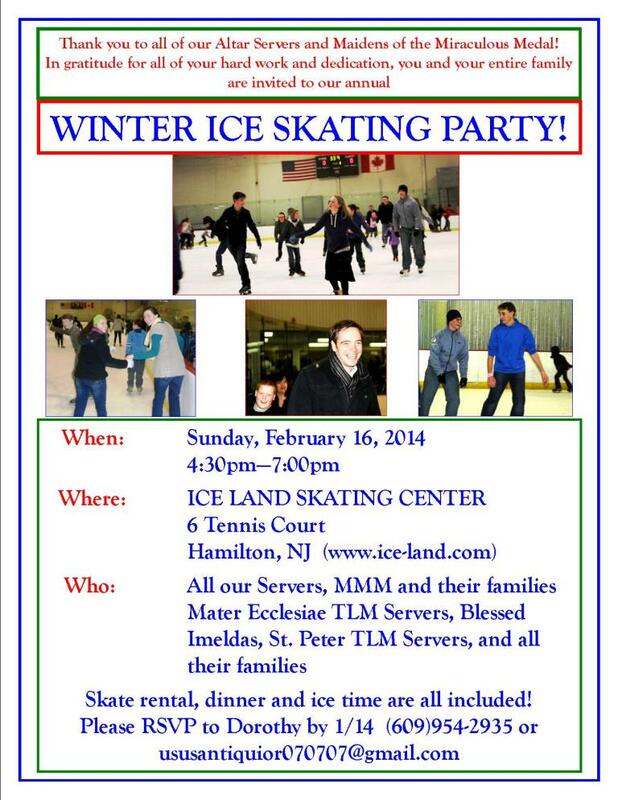 Thank you to all who were able to join us for our first Altar Server and MMM Family Christmas Ice Skating Party! We are so grateful for all of your hard work and dedication throughout the year. Have a Blessed New Year! On September 8, over 30 of our Maidens of the Miraculous Medal (MMM) and Mothers visited the Shrine of the Miraculous Medal in Philadelphia. Rev. Brian Woodrow, accompanied by Mr. Carlo SantaTeresa as Altar Server, celebrated a Traditional Latin Low Mass at the main altar of the Shrine. 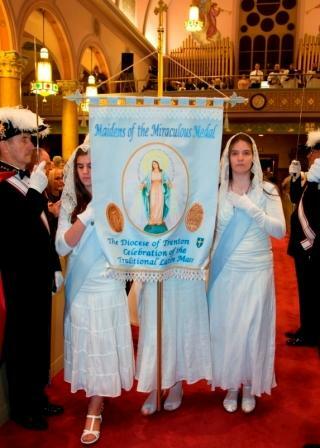 Our young ladies were then formally invested in the Miraculous Medal by Fr. Woodrow immediately after Mass. The MMM will now wear these special Miraculous Medals with their blue sashes in all of their processions. Our girls were very happy to honor Our Lady in this most beautiful way on her birthday!